I had the great honor of being invited to contribute an essay to Scott Heim’s THE FIRST TIME I HEARD… project, which features essays by writers and musicians about their favorite bands. 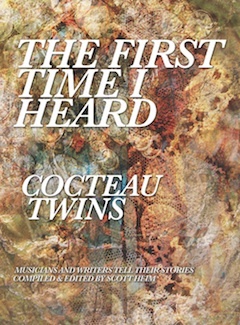 I wrote a brief essay on the Cocteau Twins, one of the books in this series which includes such subjects as David Bowie, Joy Division, Kate Bush, and the Smiths. The first of the series will be released sometime this spring. More info at Scott’s site! Here’s a sneak peek at the cover.